Marketed as a compact sports tourer, the first generation Mercedes-Benz B-Class was introduced way back in 2012 for just Rs 21.49 lakh. An amount unheard of, while talking about new Mercedes cars. And this move not only brought the premium German marque within the reach for many, but pretty much kicked the hornet’s nest, resulting in a blitzkrieg of compact luxury cars in India from every other luxury car makers present in India. The hatchback, after receiving a few nips and tucks, is back as the 2015 Mercedes-Benz B-Class and is offered with the same reliable 120PS, 1.6-litre petrol engine and an upgraded diesel engine. We get behind the wheels of the C200 CDI powered with a new 2.1-litre motor, straddled with 26 horses more than the outgoing engine. The B-Class is instantly recognisable as a Mercedes. Its face is similar to what you see in the new C-Class. There are projectors with LED rings around them, lending a premium note to the B. Move over on to the side and you can see the B-Class facelift is a tad longer than the older one. This is because the new car really is 34mm longer than the outgoing version. We would have preferred to have Mercedes give it sportier alloys than the ones you see here, especially they look a bit disappointing on this bright red sample we drove. Move over to the rear and you’ll find that the bumper is new and has a chrome strip which hides the tail pipe. The cabin of the B-Class looks more upmarket now, thanks largely to the designers picking up some stuff from the new C-Class’ parts bin. Things like the new steering wheel and sporty instrument cluster come from the entry-level rear-wheel drive Merc while the infotainment screen is a new 7-inch unit with a higher resolution display, it also gets navigation and runs on the latest OS. The finish of the cabin is top notch, exuding a feel of luxury and the vehicle also gets front parking sensors and a reverse parking camera. Other equipment includes 7 airbags, panoramic sunroof and the usual safety systems we have come to expect from Mercedes-Benz. There are no changes to the interior dimensions and as has been the case with the B, there is ample amount of room inside the cabin to seat four people in comfort. The boot space is massive but hindered by the position of the spare wheel. Mercedes-Benz B-Class comes with both petrol and diesel engines. The petrol engine of B-Class 180 Sport has a displacement of 1595 cc that produces a maximum power of 90 kW with a peak torque of 200 Nm. The B200 CDI Sports engine that runs on diesel has a displacement of 2143 cc and produces maximum power of 100 kW and maximum torque of 300 Nm. Both the variants come with a 7G Dual Clutch Transmission system that has two sub-transmission systems. The manual gearshift feature comes with steering wheel shift pedals giving an easy and smooth gear shift options to the driver. But for the traditional drivers who like their one hand on the transmission panel, there will be a difficulty in the starting to understand the gears. 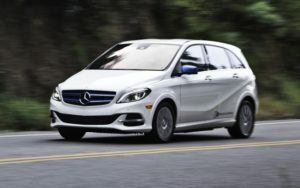 The performance of Mercedes Benz B Class is as good as the other Mercedes cars. The top speed of Petrol variant is 200 km/h and for diesel variant it is 210 km/h that is acceptable for a small compact car. The mileage of the Petrol variant is 11.9 kmpl on highway and 7.9 kmpl in the city. The diesel variant gives a mileage of 15 kmpl on highway and 11.5 kmpl in the city. Well, the mileage is not as good as it should be but considering the other luxurious interiors a customer gets, it is quite acceptable. Mercedes Benz B class braking system aims at stopping the car safely and quickly to provide driving comfort. The anti-lock braking system is present in the car with other features like Brake Assist (BAS). The rear wheels of the B-Class have disc brakes while the front wheels have internally ventilated disc brakes. The 2143 cc Diesel – powered variant delivers a fuel economy of 19 kmpl in city and 21 kmpl on highways, while the Petrol variant offers a mileage of 13 kmpl on urban roads and 15 kmpl and freeways, respectively. Praise be – this is a B-Class that proves perfectly nice to drive. OK, it’s still not that keen on being pushed beyond its comfort zone, despite a centre of gravity that’s lower than before. But the comfort zone itself is now much more habitable, courtesy of a ride that proves sweet even on some of the larger wheels that come with Sport suspension. Road and wind noise are well isolated too. The all-new engine range includes direct injection turbo petrols and diesels, of which the diesels are preferable due to their fatter torque profiles. A six-speed manual is standard, but the optional auto is preferable. Safety is something that Mercedes does very well, and the B-Class shows why. There are no less than seven airbags provided as standard, plus stability control that’ll help prevent you needing them. Standard kit also includes a driver drowsiness detector, and a system that warn of an impending collision. The new engine makes a world of a difference to the overall performance of the Mercedes-Benz B-Class and the power figures are now at least on par with our minimum expectations from the premium cars. The B-Class was always a practical everyday car, but now it also has enough fire power to be a sensible option for the long distance travel. The B-Class is not the kind of stunner one has gotten used to from Mercedes-Benz lately, it is a simple car, but at Rs 30.45 lakh (ex-Delhi) it is certainly one of the most practical and budget all-rounders from a luxury marque.